During my time here on FrontPage (coming on 3.5 years! ), I've spent most of my waking hours on features that help users build dynamic web applications for SharePoint. Now, it wouldn't surprise me if many of you haven't even heard of SharePoint - it's kinda new and in its present incarnation mainly focused on large business customers. That said, I fully expect that focus to grow :). 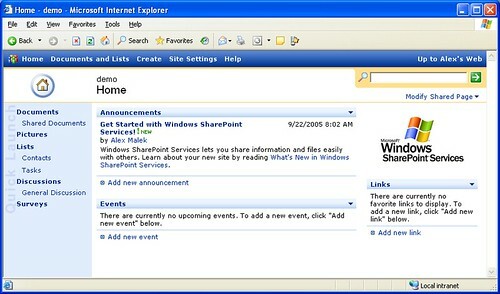 Explaining SharePoint is kinda like explaining Windows - it isn't one thing. But, if you had to boil it to its core, you could say SharePoint is a web site application for creating, sharing and viewing lists of information. It does a lot (lot!) more than that, but in the end, it all comes down to lists. When you think about it, it's amazing how much of one's daily life revolves around lists of things. For example, this blog is just a list of posts; your ‘My Documents’ folder is a list of files; your Outlook calendar is a list of appointments. What SharePoint allows you to do is use your browser to easily create lists (including lists of documents), share those lists (by giving people access to your site) and then slice and dice your list data in different ways, e.g. only show me items in the list that I created, show me my postings sorted by date, etc. 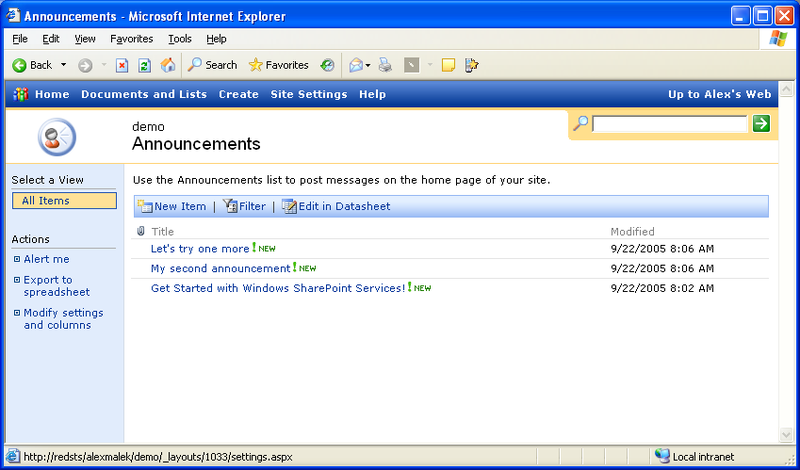 What makes SharePoint great is that it doesn't tell you what a list is. Instead SharePoint is designed as a platform for building list-based applications, allowing each user to define what content goes into their lists and how to the best way to show that content (e.g. as a flat list, as a calender, etc.) That's also where FrontPage provides lots of value - with FP you can create amazingly rich list-based web apps, all without doing any programming. 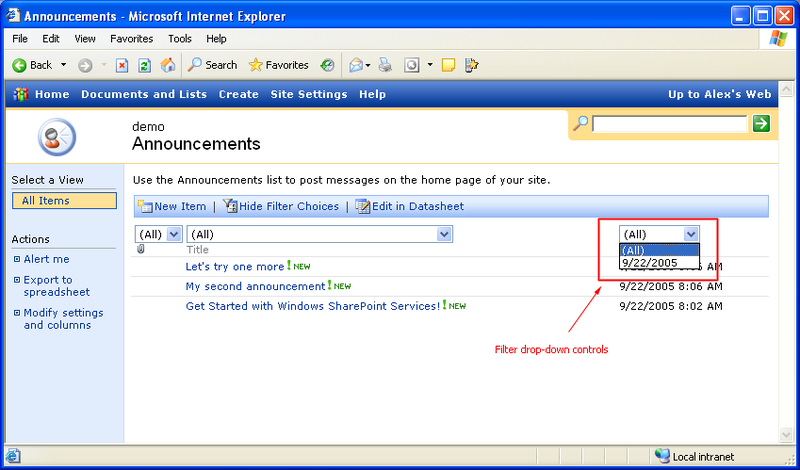 Lots more on FrontPage in coming posts - first, lemme show you what SharePoint looks like 'out of the box'. When you install WSS, the default application you get is what we call the 'Team Site'. The thing that makes it a team site is that the lists that are included by default are team-oriented, e.g. a 'Shared Documents' list for all the team documents to go in. You don't have to use the team site template though, there are also many other templates you can install, both in the box, on the web, and of course, new ones created through FrontPage! From the details page for a list, you can add new items or slice and dice your data. In the next screen shot, I show some 'filtering' controls that are available by clicking the Filter toolbar button (previous screen). By selecting a date in the dropdown, the list will be filtered to only show list items that were modified on the chosen date. 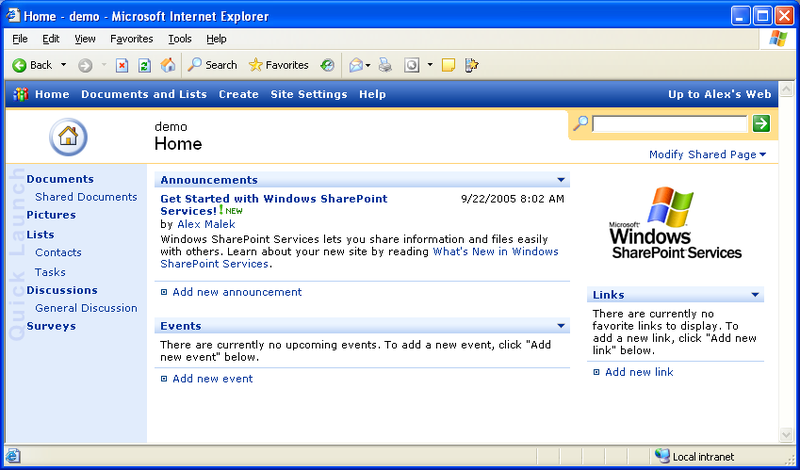 I hope these screenshots give you a taste of what SharePoint is about. As you can see, on the surface it's pretty straightforward - you can create web sites with lists of data that are relevant to you, share access to the data, as well as manipulate and view that data in interesting ways. Next up: What does any of this have to do FrontPage?